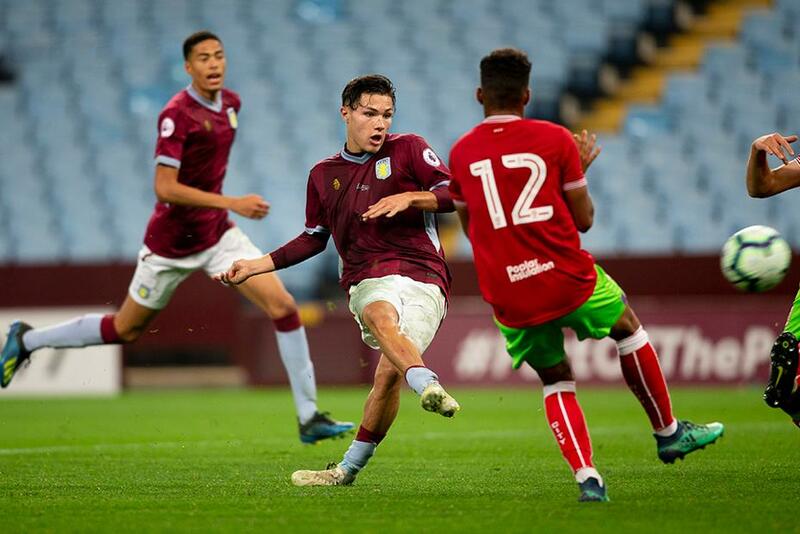 Holders Aston Villa reached the knockout stages of the Premier League Cup after a 3-0 win at Bristol City made it four successive wins in Group F.
Kelsey Mooney opened the scoring on 26 minutes with his third goal in as many matches since returning from a loan spell with Cheltenham Town. Jake Doyle-Hayes doubled the lead with a powerful free-kick in the second half and Callum O'Hare (pictured) added a third in stoppage time. Villa have 12 points from their four matches, eight and 10 more than second-placed Derby County and third-placed Plymouth Argyle respectively. Bristol City are fourth with one point from four matches. Adam Liddle and Josh Barnett each scored twice in the second half as Reading qualified from Group H with a 5-1 win over Colchester United. Jack Nolan's first-half header cancelled out Colchester's opening goal before Liddle and Barnett did the damage to make it four wins in a row for the Royals. Reading are through with 12 points from four matches six more than second-placed Fulham. Colchester are fourth with no points. Jude Bellingham's goal earned Birmingham City a 2-1 win over Fulham to take them level on points with their opponents on six points in Group G.
Geraldo Bajrami put the visitors ahead with a free-kick in the 17th minute, before Bellingham doubled the Blues' lead before half-time. Elijah Adebayo netted a consolation for the Londoners, who remain second, narrowly ahead of Birmingham on goal difference after four matches played. Marley Blair scored twice as Burnley came from behind to earn their first win in the Premier League Cup beating AFC Bournemouth 4-2 at Tameside Stadium. Corey Jordan's header and an Anthony Glennon own goal had put the Cherries in front after Blair's first-half opener. But Blair made it 2-2 before a quick-fire double from teenagers Rob Harker and Bobby Thomas settled the match. It was a first defeat in the competition for the Cherries who remain top of Group C with seven points from four matches. Burnley are two points back after the same number of matches played. West Bromwich Albion and Liverpool third and fourth with four and two points respectively, having played one match fewer than the top two. On Wednesday, Kiernan Dewsbury-Hall scored with seven minutes remaining to earn Leicester City a point from a 1-1 draw with Exeter City in Group D.
The visitors took the lead in the 71st minute when Ben Seymour scored from the penalty spot at Holmes Park, but Leicester fought back to extend their unbeaten run in all competitions to seven. The Foxes are second with four points from three matches, five behind leaders Nottingham Forest. Exeter are third with two points, one more than Norwich City with all teams having played three matches in the group.